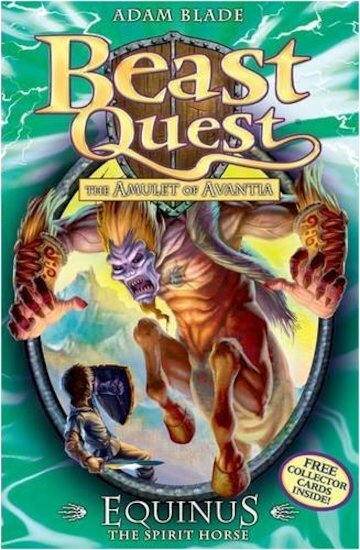 Conjure up some beastly magic in your Beast Quest adventure. Colour this beastly picture of Trillion and make him roar! Your chance to create your own Beast Quest character and story! Download this ferocious avatar of Creta the Winged Terror! Get beastly with our free Creta the Winged Terror wallpaper. Only true heroes will be able to solve this fiendish puzzle! Colour in and cut out this doorhanger fit for a noble warrior! Get beastly with our exclusive free Hawkite Arrow of the Air avatar. Make your own Claw the Giant Monkey mask. Get your claws into these fun party games! Get beastly with our exclusive free Rokk the Walking Mountain wallpaper. Your quest is to spot the differences between the pictures of the Beast Quest heroes! Get beastly with our free Trema the Earth Lord avatar. Can you find all the words and help Tom do battle with the beasts? I thought this was a good book because Equinus takes Storm’s life and they have to do their quest without him. IT HAS A GOOD BOOK COVER I HAVENT READIT YET BUT I WANT TO.